A kitchen, and a household is certainly incomplete without a fridge. A fridge is a kitchen essential – everyone in your household will be using the fridge every day. Although it is one of the most expensive appliances you can buy for your home, it should also be one of your most long-lasting household assets. With the multitude of options now available, it can be difficult to pick the right one, so we’ve collected some fridge-buying essentials to help you choose the perfect fridge for your home. In the fridge world, size does matter. It’s important to know exactly where your fridge’s home will be, and if it will fit in that designated space. Note down your fridge space measurements before going into the shops. Consider the space around your future fridge as well – will it have ample ventilation on both sides and at the rear? Most importantly, fridge doors (whether they’re single doors or double French doors) need enough room for the opening. Overall fridge storage capacity varies depending on the number of people using the fridge. Around 380-400L is enough for a couple, but a small group of people or a family will require around 500L or more. Specific storage capacities such as crisper sizes matter as well. Depending on what food you buy, you may need a bigger crisper size (e.g. if you buy more fruits and vegetables). Shelving layouts, as well as rearrangeable shelves, will help you keep your fridge organised, so always focus on getting the most use out of your fridge storage capacity. These are the common types of fridges according to freezer placements: top mount, bottom mount, side-by-side, and French doors (2-door with a bottom mount freezer). When choosing your fridge type, it’s important to consider which space you are using the most as well as height considerations. 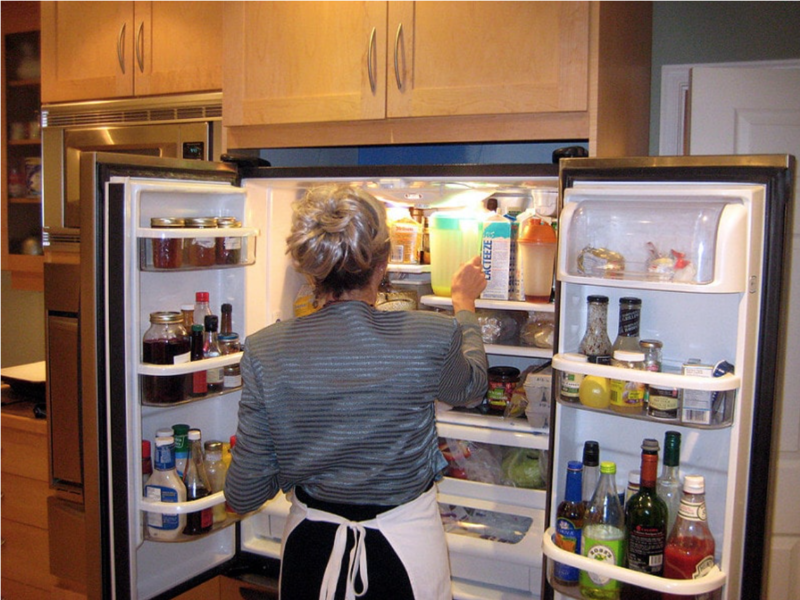 Top mount fridges have the freezers on top and are the most common, but tall people will have to crouch down more often to reach the bottom crispers and the main fridge compartment. Side-by-side and French door fridges offer plenty of extra space and extra features, yet cost more to buy than the basic top and bottom mounts. Accounting for your budget and your intended use will help you choose the perfect fridge type. The cost of running a fridge will vary depending on your fridge’s size and energy ratings. The more stars, the more energy efficient your fridge will be. Generally, fridges contribute up to 8% of your energy bill, so choosing an energy-efficient fridge will save you money in the long run. A lower energy consumption score (in kWh per year) will also save more annual running cost. Simply multiply this energy consumption figure with your current electricity price to work out a fridge’s annual running cost. Additionally, smaller fridges may cost less now but are usually less energy efficient, and large fridges generally require more energy to run as well. Extra features such as ice and water dispensers also contribute to energy consumption. A fridge’s looks come down to personal preference. Do you want your fridge to match your kitchen design or do you want it to be a statement piece and stand out? A common white steel exterior is cheaper and easy to clean, but a fingerprint-resistant stainless-steel finish will make your kitchen look sleek and professional. Buying a new fridge is an investment in your household and in your future, so picking the right one now is crucial. Consider your buying budget as well as your maintenance budget and work out how much it will cost to run the fridge you really want for many years to come. Power prices can quickly rack up depending on your chosen fridge’s energy efficiency and energy consumption value, so get the most out of your energy consumption by checking different electricity prices available to your home. Use our free tool to compare power companies and respective electricity prices to make sure you can run your new fridge in the most cost-effective way for many years to come.